Sporting heroes come in many forms. Their status is achieved through performance, it is related to service, or it may be some less definable quality. The pioneers who started sport for athletes with a disability in Australia are heroes. The pioneers were medical staff, administrators, escorts and athletes from the 1950s, 1960s and 1970s. Doctors specifically employed sporting activities to improve the lives of young men and women with spinal cord injuries. Nascent administrators initiated sporting opportunities for patients many of whom went on to become Paralympic athletes. Escorts – physiotherapists, trainers and nurses – assisted athletes to travel and compete in a sporting world not really prepared for athletes with disabilities. Athletes broke contemporary cultural norms, rejected stereotypes about disability, and overcame barriers to compete. The contemporary opportunities for Australian athletes to compete in the global spectacle of Paralympic sport was only possible after these pioneering doctors, administrators, escorts and athletes rose above a host of individual, collective and cultural challenges. The Australian Paralympic Hall of Fame members include five of the pioneers: Sir George Bedbrook, the medical practitioner who is recognised as the father of disability sport in Australia; Daphne Ceeney who is Australia’s first female competitor and gold medallist at the Rome 1960 Paralympic Games; Kevin Coombs who is the first Aboriginal athlete to represent Australia at a Paralympic or Olympic Games; Tracey Freeman who was the most dominant athlete at the Heidelberg 1972 Paralympics; and Frank Ponta whose contribution as an athlete, coach and administrator is unsurpassed. More recent members of the Australian Paralympic Hall of Fame include Louise Sauvage and David Hall. Louise Sauvage dominated her sport of athletics for a decade winning thirteen Paralympic medals, demonstration sport medals at the Olympics, world championships and world records. David Hall is one of the world’s most decorated wheelchair players whose twenty year career included world championships, grand slam titles, world cups, and four Paralympic Games including Australia’s first ever gold medal in the men’s singles tournament. Throughout their careers, they raised the profile and perception of Paralympic movement. The final two members of the Australian Paralympic Hall of Fame are Ron Finneran and Adrian Smith. Ron Finneran participated at the Örnsköldsvik 1976 Winter Games and has a distinguished career as an administrator in winter sports, which included Chef de Mission roles at five consecutive Paralympics. Adrian Smith was founding director of the Australian Paralympic Federation (now Australian Paralympic Committee – APC) and, most famously, personally underwrote the cost of sending the Australian team to the Tignes-Albertville 1992 Winter Games. 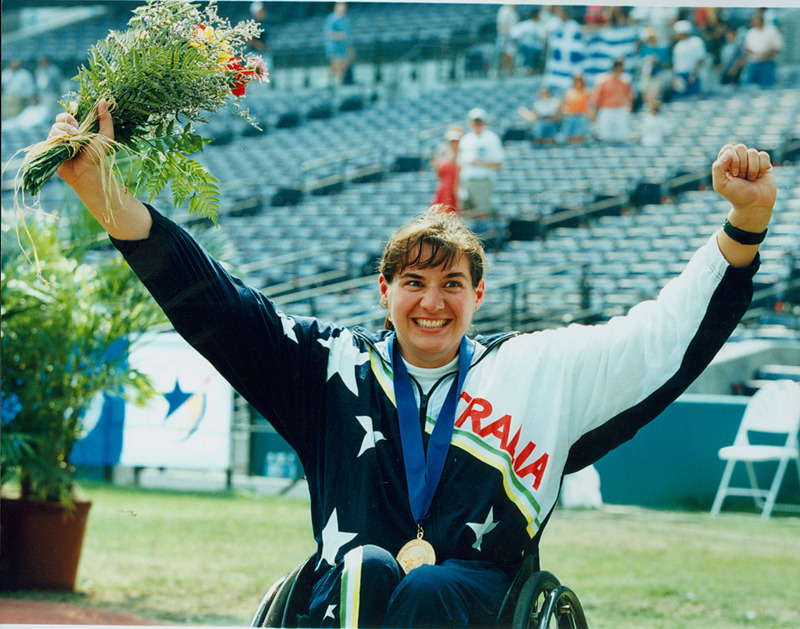 Along with Ron Finneran, Adrian Smith spearheaded the bid campaign for the Sydney 2000 Paralympic Games. Other non-athletes, who are recognised as making significant contributions to the Australian Paralympic movement, include Maree Little, a long-time advocate and administrator for athletes with an intellectual disability, Nick Dean and Paul Bird who served as Chef de Missions at multiple Paralympics, and Ken Brown and Doug Denby in their administrative capacities at the APC. Scott Goodman and Iryna Dvoskina (athletics), Peter Day (cycling) and Steve Graham (alpine skiing) are acknowledged for their impact on coaching athletes with a disability. The skills, attributes and influence of Kate McLoughlin as Chef de Mission at the Rio de Janeiro earned her the APC President’s Award for Excellence in Sportsmanship. Paralympic heroes in the pool include Priya Cooper who won nine gold medals over three Paralympic Games, Siobhan Paton who won six gold medals at Sydney 2000, Matthew Cowdrey who is Australia’s most decorated Paralympic medallist, Jacqueline Freney who won eight gold medals at London 2012, and Maddison Elliot won nine medals at London 2012 and Rio de Janeiro 2016. Like swimming, athletics and cycling have produced a number of outstanding performers who are highly respected in the Paralympic movement. Tim Sullivan has won an impressive ten gold medals over three Paralympics, Lisa McIntosh won five gold at Sydney 2000 and Beijing 2008, Evan O’Hanlon secure five gold at Beijing 2008 and London 2012, and swimmer turned cyclist Kieran Modra has competed at seven Paralympics winning ten medals. Liesl Tesch’s medal winning performances in both basketball and sailing are recognised as epitomising the ‘spirit of the games’. In the context of the winter games, Michael Milton won Australia’s first gold medal in an illustrious career that spanned six Paralympics (including one summer Games as a cyclist), while Jessica Gallagher was the first Australian woman to win a winter Paralympics medal, and has won medals in both winter and summer Paralympics. Cameron Rahles-Rahbula is acknowledged for his extended career over four Winter Paralympics, and Toby Kane won the President’s Award for Excellence in 2010. Some Australian athletes have been not only great competitors, but also represent the Paralympic movement and disability sport in much broader capacities. These include many of the athletes mentioned previously who act as advocates and spokespeople for disability and are recognised by many Australians in these capacities. Libby Kosmala in one of these athletes. Her involvement in Paralympic sport started in Tel Aviv 1968 in an administrative capacity and then, as a rifle shooter, her career stretched to another twelve games finishing at Rio de Janeiro 2016. Dylan Alcott was originally part of the winning Australian Paralympic basketball team in Beijing 2008. It was, however, his success as a double gold medallist in tennis at the Rio de Janeiro 2016 Games that propelled his media career in radio and television. Kurt Fearnley has not only been an incredible performer over five Paralympic games where he won thirteen Paralympic medals, but he is one of Australia’s most decorated sportspeople (either able-bodied or disabled), and makes an incredible contribution to Paralympic sport, able-bodied sport and issues related to disability which was recognised in his nomination as Australian of the Year (2019). "This must have been my destiny to do what I've done"
Daphne Ceeney: "... a new start in life." Daphne Hilton (nee Ceeney) talks about the difference being at Mt Wilga made to her life. "He regarded disabilities as just part and parcel of life." "I thought the top of my head had gone"
"Tony would cut up an old rubber tyre and tie it round their legs"
"Just get in there, do your job, and go home again"
"I just put my name down as a manager or whatever you call it." "As a 14 year old, your're sitting there with 2 of the best 5 guys in the world." "It just made it worth everything ... I was the happiest girl ever." "It was absolutely amazing, it had us all in tears"